If you dream of a neat and tidy kitchen, then here are the simple tips you will have to follow to enjoy a kitchen picture perfect. Keep the countertops clear – Clutter will always start on your kitchen countertop, so resist the urge to place things like mail, keys, magazines, dishes or jars of food on your counter. Look at making space in your shelves and always keep your counters clear. Keep things in cabinets – If you want things to be neater, make use of your cabinets and store all your kitchen items away and out of sight. If you have too much, and often buy items you never use, look at giving them away to a friend or family member. 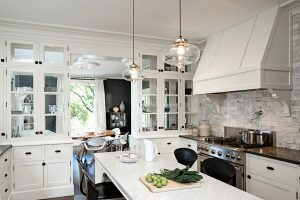 Follow the “one in, one out” rule – This rule means that if you bring anything new for the kitchen, something that is not in use has to go out. Keeping this rule in mind will often mean that you always keep items that you truly use daily. “Don’t put it down, put it away” rule – Everything you own should have a place, which means that you will always place items where they belong and therefore not leave items lying around the kitchen and dining area. Remove stuff from your refrigerator – Remove paper, notes, photos, lists, and magnets from the refrigerator, as they will make your kitchen look cluttered. Find alternatives to the pile – Look at hanging your items for easy access instead of piling them in your cabinets.